Pretend it’s not a western. Pretend it’s historical fiction. Imagine this story takes place in Ireland or South Africa instead of western Missouri. A young woman marries a religious man who takes her away from home to start a new life. The two raise several children on a hard-scrabble farm. When he dies, she re-marries, this time to a doctor. More children are born. Unable to continue living a life he feels is constantly hindered by a distant and unjust government, her favorite son becomes involved with a violent independence movement. He later joins the army and fights on the losing side in a civil war. Disillusioned and jaded, with no job-prospects he turns to a life of crime. Before he can turn himself in, do his time and begin his live again, he is killed by one of his compatriots. His mother is left to live the rest of her life with a reputation she had little hand in generating. What makes this story a western? Would it be substantially different if it were a book about a woman with a son in the IRA instead of a book about the mother of Jesse James, Civil War veteran turned outlaw? It’s not a pretty story. Certainly not along the Missouri-Kansas border at the time of the American Civil War. I’ve a hard time deciding if there were any heroes in that particular struggle, but I’m certain Jesse James was not one of them. So how does one approach a book about the woman who raised him, who loved him more than any of her other children and protected him when she could even though she knew her protection made more crimes possible, including murder? To her credit, Ms. Dodd doesn’t whitewash her story, as far as I can tell. Her heroine loves her son, admires him, pushes him to action, protects him and his reputation as much as she can. But even she reaches a point where she must simply refuse to look too closely at what her son has done. In order to remain the mother she has always been she must make herself willfully ignorant of her son’s crimes. This is probably the healthiest choice she could have made. Not the wisest or the best, but the only one that would work for her. And Mamaw worked for me. 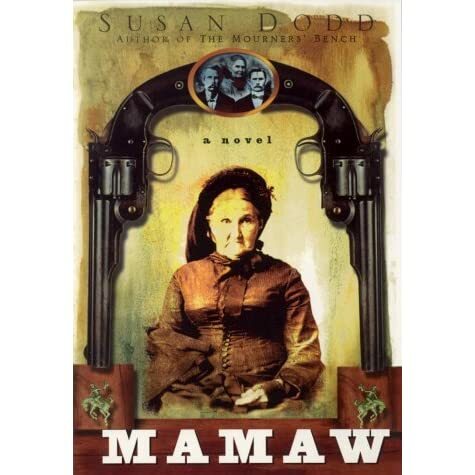 Whether it’s a western or not, whether or not the question even matters, Mamaw is a fascinating book that took me into the life of someone I never expected to meet. This was one of the books I read for the Hop-a-long Git-a-long Read-a-long, a challenge I use to run back in the day. While it never really took off, I did get double digit participation each year I ran it–I think three years total. It was fun for me and a few of the people who joined in let me know that their overall opinion of the western genre changed for the better as a result. I remember this book, Mamaw. It’s wonderful book; one that stayed with me for a long time. I’m pretty sure I kept my copy to re-read in my retirement. This sounds like a wonderful book. And I’m sad I missed Hop-a-long Git-a-long. I enjoy Westerns, but they’re a genre I don’t pick often enough. This one is terrific. I sent it along to my brother who also enjoyed it.